Posted on Fri, Aug 31, 2012 : 5:20 a.m.
Paul Dimond is well known locally as an attorney, but now he's branched out into fiction writing. Over the course of Paul Dimond’s long career as a lawyer, academic and self-described “policy wonk” for President Bill Clinton, the Ann Arborite has been the author of plenty of published works, including several legal tomes. His most recent effort, however, takes him down a different path. With the publication of the tween fiction book “North Coast Almanac,” Dimond, 68, acknowledges a shift in careers. The book—inspired by an area in Northern Michigan near Glen Arbor and written in an effort to help his grandson Jack learn to read—is the first of several works of fiction he has in mind. Before the plane had landed, they had finished drawing the rough figure of a totem pole with the three generations of the Pippin clan, their long-time animal allies and new adversaries. The result—with a finished version of that original totem on the cover—is a multi-generational work about tough times and an even tougher family. The book’s publisher is Ann Arbor’s Huron River Press. Dimond said local author/educator Nicholas Delbanco encouraged him and helped him find an editor, speeding the process along. 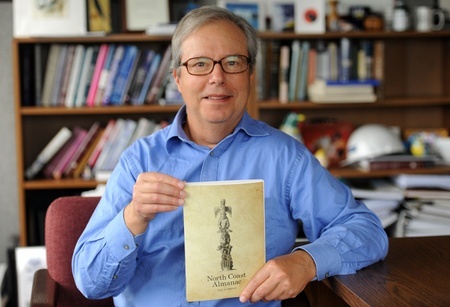 ‘Over the 12 months it took me to write the 12 chapters of ‘North Coast Almanac’ and read them with Jack, he graduated from learning to read to reading to learn,’ Dimond said. “He gobbles up books in print and on his eReader and has begun to write short stories and essays on his own. Dimond grew up in Ann Arbor and has been associated with the Miller-Canfield firm since 1989. He and his family have close ties to the Glen Arbor area dating back to when he was a child. He’s referring to the time he served as Special Assistant for Economic Policy to President Clinton. When he returned home in the fall of 1997 his love affair with Northern Michigan resumed. Eight years ago, when he turned 60, Dimond said he knew it was time for a sea change. Dimond said his law career is winding down and most of his time now is spent writing and with his family. will be the historical novel called ‘Belle.’ Set in the years 1899-1953, it's about a reclusive woman poet born in Glen Arbor who raises a younger brother when their mother dies. When Belle comes to Ann Arbor when she’s 21 to go to school, she meets Robert Frost, Theodore Roethke and Wystan Auden. It’s the story of their time together,” he said. There’s a big advantage to writing fiction over fact, Dimond said. Fri, Aug 31, 2012 : 12:54 p.m.
Great book by a great person. Ross: Matt and Jane have your copy of the book. Fri, Aug 31, 2012 : 12:48 p.m. I can't wait to crack open this book! Fri, Aug 31, 2012 : 12:32 p.m.
Fri, Aug 31, 2012 : 11:56 a.m. I look forward to reading this with my daughter Ayla. Thank you for writing this book!